The Carbonara Club. The Real Thing. Saving Italy’s gastronomic heritage in the world. You see, when you really love Italian cuisine, because it’s simple, authentic, full of love, seeing it being so methodically destroyed makes me want to go on a rampage. You. Yes, you. I can see you, about to chuck your crème fraîche into your so-called “Carbonara”. The only reason you’re still alive is because it’s generally considered illegal to kill you. First of all, stop calling your mess “Carbonara” immediately: it really irritates us (that’s me and Italy). 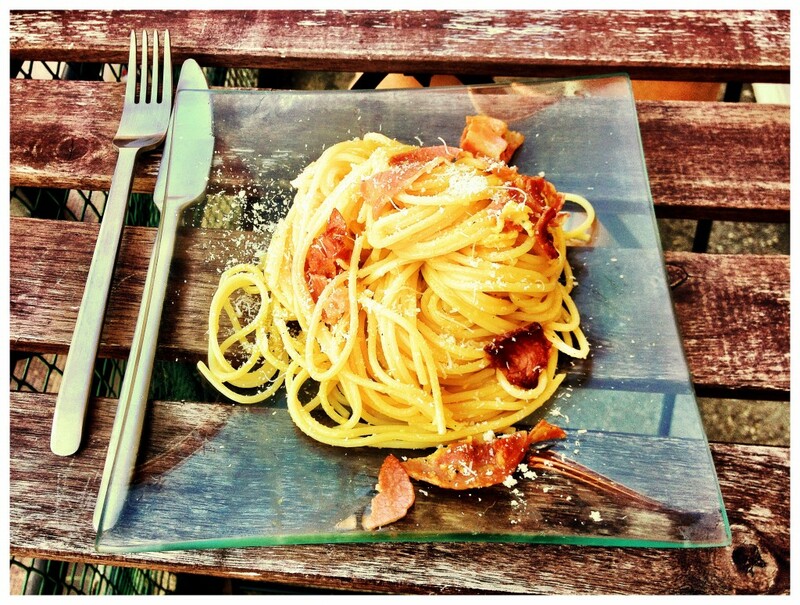 The authentic recipe for « Carbonara » comes from Rome and Rome deserves to be serenaded, with one knee on the ground. So let’s start all over again: do your best Italian impression and sing the word « Carbonara » wholeheartedly. Once you hear the sound of a lyre in the background, you’re ready to cook the real thing. I have no idea how come this absolutely wonderful dish has become an indescribable mush of bacon and cream. Well, actually, I do. Remember your student years: it was your favourite meal because it was “easy” to do. Some cheapo bacon here, a dollop of UHT cream there, mix it together and there you have it! Look, I’ve cooked a “carbonara”! I’m going to strangle you with my bare hands, do you get me? Where did you ever eat this in Italy? Who made you believe this was Italian? Tell me now so I can get whoever served this sent to prison! You are insulting generations of Roman mammas if you do this wrong. Stop right this second. And read what I’m about to write carefully because I’m going to share the one and only Pasta alla Carbonara recipe. Do you remember the amazing Pasta alla Carbonara you had once in Rome? So do I. I could eat it even if it was 40 degrees outside. So, please, put me out of my misery because it breaks my heart a little more each time you try to cook it. So this is going to be straight to the point, no-nonsense, and merciless. Afterwards, I’ll watch over you. Every time you try to cook it any other way, I’ll come and smack you round the head with my rolling pin and curse your next 5 generations. Chiaro? First, the ingredients. Listen up. 1 egg per person + 1 egg for the whole dish. That’s how it’s done. So for 2 people, use 3 eggs. For 4 people, 5 eggs. Capito? Throw your plasticky bacon out the window and buy some real pancetta. If you want to impress, you could even go to your nearest Italian delicatessen and ask for guanciale, it’s what the Romans use. It’s basically pig’s cheeks and it’s delicious. As much parmigiano reggiano as you like. If you’re a big fan and know where to find it, you should use pecorino romano. As a LAST RESORT – you could get grana padano, but only on the grounds that you don’t live in Rome and to show you I can be flexible and somewhat understanding. Salt, pepper, olive oil. A little bit of garlic if you wish. I don’t approve but I’m willing to let you express your creativity. But that’s the only thing I’m giving you. La pasta. Durum wheat pasta. Buy an Italian brand such as Barilla, De Cecco, Rummo, or, even better, Voiello. You’re not allowed anything else. Choose them preferably long cut because that’s how the Roman mammas choose them and you should respect this ancestral tradition. So: spaghetti n.5 – the most common – or, if you like short cut pasta, tortiglioni, mezze-maniche, and so on. And, listen to me carefully, THAT IS IT. Yes, that’s right, that is it, so forget about anything else. No cream, no tomatoes, no onions, no parsley. AND NO OLIVES OR DUMPLINGS OR COURGETTES OR SPRING PEAS OR SAUSAGES. I can already hear you telling me, like a good « Carbonara troll » : “My pasta is going to stick! It’s going to be dry! There won’t be enough sauce!” Please, for the love of Jupiter, shut up ! Take a large cooking pan and fill it with water. Use plenty of water because pasta needs to dance around in the water and it needs space to do so. Do you like going to a club and dancing on a packed dance floor? Of course not. Pasta is the same. It has a golden colour for a reason: it is precious, so you shower it with happiness and leave it some space to move around. Cover the pan with a lid and bring the water to a boil. In the meantime, separate the eggs. You only need to use the yolks for the carbonara. Put the whites in the fridge, you can use them to make meringues later. Add a bit of salt and pepper to the yolks. Then, add the freshly grated parmesan and/or pecorino romano. Don’t try to cheat by using ready-grated supermarket-bought fake parmesan because I’m right behind you, ready to stick a fork in your collarbone. If you have an electric whisk, then your eggs will be creamy quickly. Otherwise, you’ll have to whisk by hand for quite a while, continuously and energetically. Don’t forget I’m watching you. Once your eggs and parmesan are a creamy texture (creamy without cream, that’s the Italian magic !) – there should even be a small foamy top – you can stop whisking. Then – or at the same time, really – in a small cooking pan, or a frying pan, whichever, cook your coarsely chopped pancetta in olive oil. You could add a bit of pepper if you want it a bit spicier. By the way, the name “Carbonara” comes from the colour of the pepper in the recipe, which is a reminder of the colour of coal – carbone. In Rome, this dish was served in big portions and filling enough for the workers to cope with their working conditions. Apparently. Then, you cook the pancetta until crispy and golden brown. Thus, the pancetta will match your GOLDEN pasta. Once the pancetta is golden, remove from the heat and keep on the side. The water is now boiling and you can add coarse salt. If you don’t have any coarse salt, just give up and cook something else. So, a handful of coarse salt and then, the pasta. DO NOT PUT ANY OIL INTO THE WATER YOU FOOL! The water must boil continuously. Keep an eye on the pasta and stir from time to time, watching them wriggle with joy. Quantity-wise, allow 100 to 120g of pasta per person. And don’t cook half a packet if you’re on your own for God’s sake: don’t come and complain your pasta is dry if you do this. For example, if you cook spaghetti, which is coincidently my favourite, use 100g per person. The pasta must be al dente. But you don’t know how to cook pasta al dente. You think you do, but really, you don’t. I know it. You’re doing it wrong. So, here’s a tip: take one minute off the recommended cooking time on the packet. So, for spaghetti n.5, it’s 8 minutes. Start the timer as soon as the pasta is added to the boiling water, take it out after 7 minutes, and drain. The pasta will keep cooking in their steam and heat. Don’t leave the pasta in the colander for ages – put them almost straight away into your bowl with the eggs and parmesan mixture, and stir gently. If I trusted you, I’d tell you to taste the pasta before draining. But I don’t trust you. So use your timer. You won’t succeed straight away. You and I know that full well. But soon, little pasta padawan, you will manage to cook spaghetti al dente. Let me give you another tip to make sure that your eggs and parmesan mixture is creamy enough: whilst the pasta is cooking, add one or two spoonfuls of the pasta water to your mixture and stir well. Yum yum. Moreover, the boiling water will slowly cook the raw eggs and make it safe for consumption, in case you are not 100% sure your eggs can be eaten raw. Once your spaghetti are poured onto your creamy mixture, add the pancetta and mix everything together. Gently! Serve your pasta in a nice bowl and if you love parmesan or pecorino romano, like me, you can add some more on top of your dish. If you can’t get it the same as the picture above, don’t beat yourself up, KEEP IT SIMPLE. It’s the easiest recipe in the world. But if you do it differently, you’ve never had pasta alla carbonara before. It’s delicious, everyone likes it, and it’s a gift Italy and Rome have generously shared with the rest of the world. As you serve it, don’t forget to make up a little story, like an Italian would. Tell your guests you chose the best pancetta you could get in the whole neighbourhood. That an old Italian mamma gave you the recipe on her deathbed. That your spaghetti danced to the sound of Paolo Conte whilst swirling in the boiling water. So there you go. Stop the destruction. Share the love. Become an ambassador of the Carbonara Club. Together, we can give this dish its Roman roots back. I’m counting on you. I want to see your pictures on Twitter’s #carbonaraclub. Translated from French. Courtesy of @fieldelanation. But it is en angliche ! Le monde ne mérite pas cette universalité. C’est vrai pour la pizza en France. Toutes nos excuses, mea culpa, mea maxima culpa. Bravo Floriana, je me décide enfin à écrire un commentaire. Quand j’ai découvert ton blog avant l’été, j’ai cru me lire ! Je ne parle même pas de l’ail, ça doit être une faute de frappe de ta part, rassure-moi. Quant à l’huile pour faire revenir le guanciale, autant faire cuire un magret dans du beurre. Ne t’y méprends pas, je suis d’accord avec toi sur quasi tout en dehors de ça, moi aussi je mets la bialetti sur le côté de la plaque si celle-ci est électrique ;) Ca m’a fait rire, tout comme les commentaires de sky d’allemagne-italie que tu connais au final par cœur..je dois pas en être loin ! Puisque tu habites parme, je te conseille ce we le salon de vins naturels (http://www.vinidivignaioli.com/). Bravo encore, la prochaine fois je te raconterai pourquoi tourner/ne pas tourner le risotto ! Merci pour ton commentaire en tous cas! A presto allora ! ouais c’est clair c’est bon la vraie carbonara. mais désolé si j’aime AUSSI la « carbo » bien faite à la française (crème épaisse, oignons, lardons, thym, jaune d’oeuf, comté rapé, et voir même quelques champignons de paris et/ou olives en tranches). Répondre à adriano Annuler la réponse.